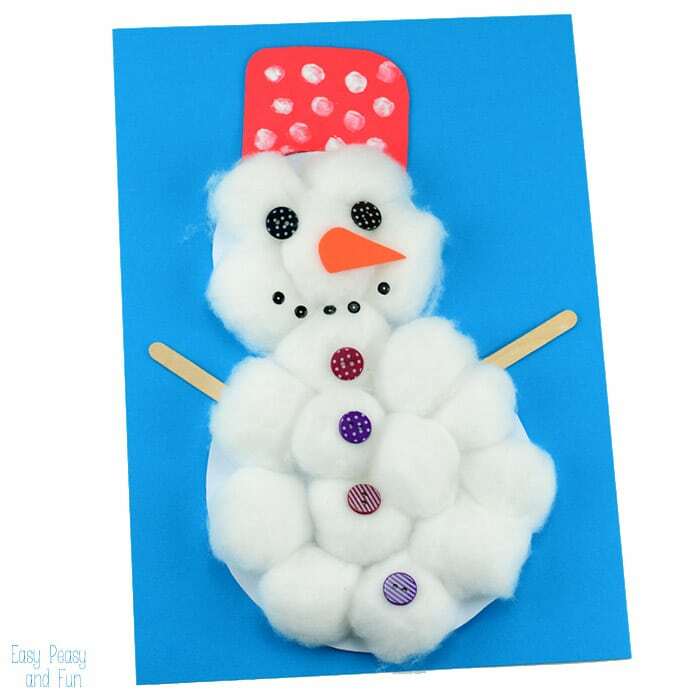 This cotton ball snowman craft is perfect for preschoolers and kids in kindergarten, it’s super easy to make and allows for creativity when it comes to decorating! 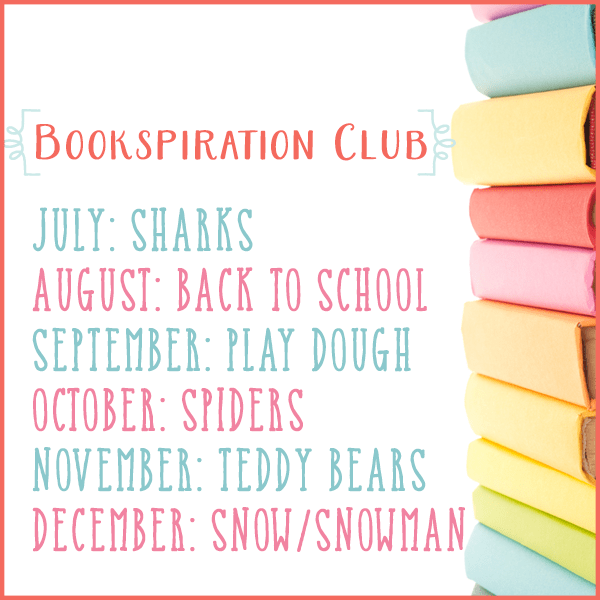 We’ve been making quite a few snowman crafts these past few days, some are already on the blog and quite a few are yet to come in the next couple of weeks. Whether you like winter or not, snowmen are certainly a fun part of it – I’m not really a fan of this cold part of the year, can’t even imagine how I could run around in the snow and have snow fights and all as a kid, somehow being oblivious to the, well cold… But even as an adult I do kind of enjoy building snowmen… And throwing a snowball or two, as long as it’s not “returned to the sender” 😛 . 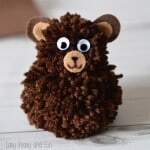 decorations – buttons, sequin, scrap paper, popsicle sticks, pom poms, fabric, craft foam… Whatever you can find, naturally pick the age appropriate decorations, larger ones for toddlers and preschoolers, smaller one for older kids). 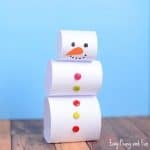 Start by cutting a snowman shape from the white paper. Generously apply glue to the snowman shape. 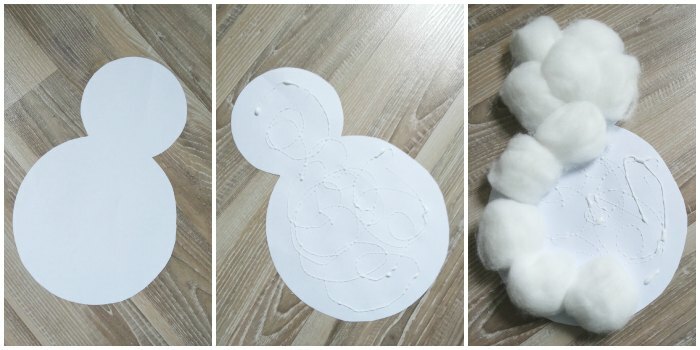 Start placing cotton balls until you fill out the whole shape. You can let it dry for just a bit. We used two popsicle sticks to make hands, buttons to make eyes and buttons, black sequin to make the mouth, carrot was cut out of orange craft foam and the hat is made out of red craft foam and decorated with white fingerprints. Now all that is left is to glue on the snowman onto blue background and display the artwork. 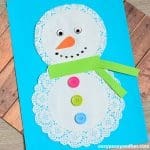 Naturally you can also have the kids make snowflakes on the background with their fingers. 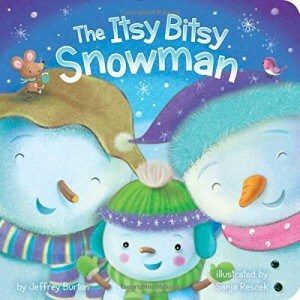 To go along with this cotton ball snowman craft I’ve chosen this sweet book! 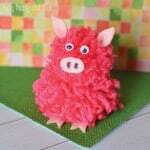 You can read the book with your kids and then you can create this one together. Have older kids? 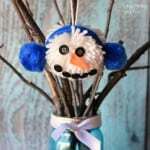 They will love making this snowman pom pom craft. 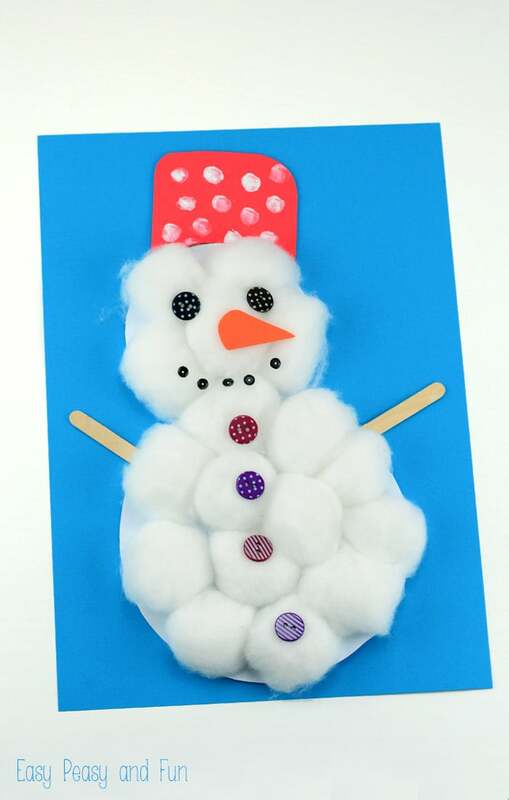 Or if you’re still in the festive mood you can make this lovely snowman ornament. Thank you for detailed description of this great activity. 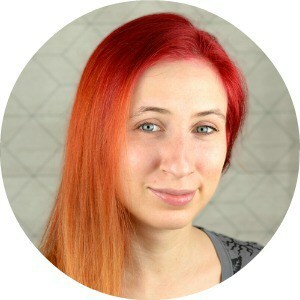 Will share it in my blog post! I really love this cotton ball snowman. 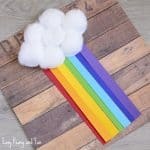 I know children would love making it. Several of these snowmen would make a very cozy winter scene-especially if they were placed on a mirror. Thank you for the ideas and the instructions.. I really appreciate them.